1. Before she started writing, Rumer Godden ran a mixed race dancing school, the Peggy Godden School of Dance, in Calcutta. As a young woman Godden was known as ‘Peggy’ by her family, after he real first name, Margaret (Rumer was her middle name). The school was a success but considered scandalous and she received letters and phone calls from both the British and the Indian community, some outraged, others asking if they could hire the girls. 2. Her first adult novel, Black Narcissus was a bestseller, but she ended up using the money to pay off her husband’s debts. He abandoned his family to join the army, leaving them in financial trouble after making a series of bad speculative investments. 3. Living in remote Kashmir with her children and a friend, the family suffered attempted poisoning at the hands of their homicidal cook who put ground glass and opium in their food. Fortunately only the family dog died at his hands – ‘life has been like an Agatha Christie’ she wrote to her sister, Jon (her sister’s real name was the rather marvellous Winsome Ruth Key Godden, but she wrote under the name Jon Godden). 4. With her second husband she lived for a few years at the end of the 1960s in Lamb House in Rye. This was formerly the home of Henry James, E. F. Benson and Montgomery Hyde. Victoria Best is one of the founders and editors of Shiny New Books: What to Read Next and Why, where this post was originally published. 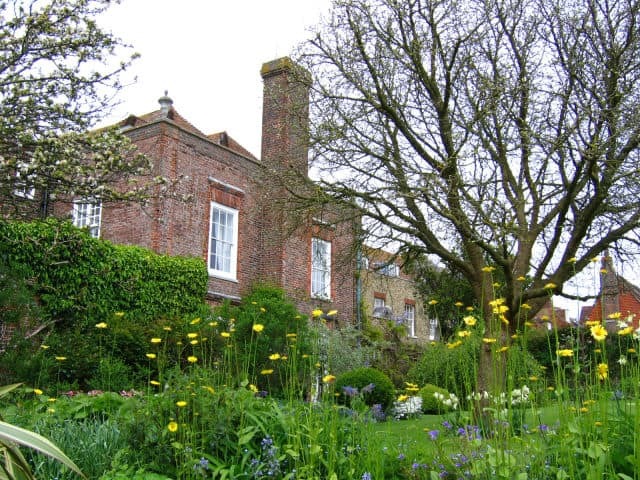 Image: Lamb House, Rye (author: Stephen Craven); share-alike licence. When I was reading this post, I was trying to remember why her name is so familiar to me! After a Google search, I realised that it is because two of her children’s books (The Doll’s House and The Story of Holly and Ivy) were favourites of mine during my childhood. It is interesting to learn about her life. I remember seeing The Doll’s House on the television. I was so incensed by Marchpane, but also fascinated by her. When I sought out the book I remember being really affected by the ending. Oh, I didn’t know there was a TV adaptation of it. Yes, it is quite a dark book and Marchpane is especially horrid! I remember reading it as a child and feeling a sense of foreboding. Godden’s novel Greengage Summer remains one of my favourite, must have on my shelf novels. Much thanks for this post! Godden deserves to be better known. I loved The Doll’s House as a child and as an adult feel it to be a small masterpiece. Also big fan of Kingfisher Catch Fire and Black Narcissus. Not to be missed: her childhood memoir, co-authored with sister Jon, Two Under the Indian Sun. I am a Rumer Godden fan and enjoyed this article! My favourite Rumer Godden story is, The Mousewife. It is a children’s story however I suspect that Rumer may have been writing about one of her husbands. It’s a poignant story. I have always been fascinated by the romance of India especially early last century – she certainly led a fascinating life and I recently read her biography by Ann Chisholm published in 1998. Remembering my father reading “Miss Happiness and Miss Flower” aloud to us, his 4 daughters…. Never heard about this writer, good to know. 91 years old, she did have long time for writing that´s for sure. Interesting as always Interesting Literature. This has made me want to go back and give the Greengage Summer another go.